This 1943 photograph by Ansel Adams shows the Manzanar Relocation Center located near Independence, California. 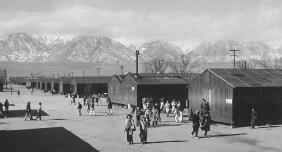 The camp was one of ten centers to which Japanese American citizens and Japanese resident aliens were held during World War II. In the midst of World War II (WWII), from 1942 to 1944, the U.S. Army evacuated Japanese Americans living on the West Coast from their homes and transferred them to makeshift detention camps. The army insisted that it was a "military necessity" to evacuate both citizens and noncitizens of Japanese ancestry, and its actions were supported by President franklin d. roosevelt and the U.S. Congress. Those who were evacuated suffered tremendous losses, being forced to sell their homes and belongings on very short notice and to live in crowded and unsanitary conditions. A few Japanese Americans challenged the constitutionality of the evacuation orders, but the Supreme Court at first ruled against them. In the years since the end of WWII, the U.S. government has acknowledged the injustice suffered by the Japanese American evacuees, and it has made several efforts to redress their losses. After Japan bombed Pearl Harbor on December 7, 1941, persons of Japanese descent living in the western United States became a target for widespread suspicion, fear, and hostility. Several forces contributed to this sense of anger and paranoia. First, the devastating success of the Pearl Harbor attack led many to question how the U.S. military could have been caught so unprepared. A report commissioned by President Roosevelt directly blamed the U.S. Army and Navy commanders in Hawaii for their lack of preparedness, but it also claimed that a Japanese Espionage network in Hawaii had sent "information to the Japanese Empire respecting the military and naval establishments" on the island. This espionage ring, the report asserted, included both Japanese consular officials and "persons having no open relations with the Japanese foreign service" (88 Cong. Rec. pt. 8, at A261). This accusation against Japanese Hawaiians, though never proved, inflamed the mainland press and contributed to what quickly became an intense campaign to evacuate Japanese Americans from the West Coast. A second cause for the hostility directed at Japanese Americans was the widespread belief after Pearl Harbor that Japan would soon try to invade the West Coast of the United States. Much of the Pacific fleet had been destroyed by the Pearl Harbor attack, and the Japanese had gone on to achieve a series of military victories in the Pacific. A West Coast invasion seemed imminent to many, and statements by government officials and newspaper editors stoked fears about the loyalty of Japanese Americans and their possible involvement in espionage activities. On January 28, 1942, for example, an editorial in the Los Angeles Times argued that "the rigors of war demand proper detention of Japanese and their immediate removal from the most acute danger spots" on the West Coast. Syndicated columnist Henry McLemore was less restrained in his assessment, which appeared in the San Francisco Examiner on January 29: "I am for immediate removal of every Japanese … to a point deep in the interior. I don't mean a nice part of the interior either … Let 'em be pinched, hurt, hungry and dead up against it…. Person ally I hate the Japanese." In the war which we are now engaged, racial affinities are not severed by migration. The Japanese race is an enemy race and while many second and third generation Japanese born on United States soil, possessed of United States citizenship, have become "Americanized," the racial strains are undiluted…. It, therefore, follows that along the vital Pacific Coast over 112,000 potential enemies of Japanese extraction are at large today. There are indications that the very fact that no sabotage has taken place to date is a disturbing and confirming indication that such action will be taken (War Department 1942, 34). Many other leading politicians and government officials shared De Witt's views. The California congressional delegation, for example, wrote to President Roosevelt urging the removal of the entire Japanese population from the coastal states. California state attorney general Earl Warren, who would later become governor of California and chief justice of the Supreme Court, strongly advocated the evacuation of the Japanese, arguing before a congressional committee that to believe that the lack of sabotage activity among Japanese Americans proved their loyalty was foolish. De Witt's report, combined with pressure from other military leaders and political groups, led President Roosevelt on February 19, 1942, to sign Executive Order No. 9066, which gave the War Department the authority to designate military zones "from which any or all persons may be excluded." Despite warnings from the U.S. attorney general, francis biddle, that the forced removal of U.S. citizens was unconstitutional, Roosevelt signed 9066 with the clear intent of removing both citizens and noncitizens of Japanese descent. The order theoretically also affected German and Italian nationals, who greatly outnumbered Japanese people living in the designated areas. However, Germans and Italians who were considered suspect were given individual hearings and were interned. The Japanese, on the other hand, were treated not as individuals but as the "enemy race" that De Witt had labeled them in his evacuation recommendation. Congress hurriedly sanctioned the president's order when, with little debate and a unanimous voice vote, it passed Public Law No. 503, which incorporated the procedures of 9066, criminalizing the violations of military orders, such as the curfews and evacuation directives outlined in the order. The signing of 9066 and its passage into law immediately set in motion the steps leading to the removal of Japanese Americans on the West Coast from their homes and communities. On February 25 General De Witt ordered the eviction of the two thousand Japanese living on Terminal Island, in Los Angeles, giving them 24 hours to sell their homes and businesses. On March 2 De Witt issued Military Proclamation No. 1, which declared the western half of California, Oregon, and Washington to be military zones with specific zones of exclusion. This order allowed Japanese living there to "voluntarily evacuate" the area. Because the Japanese knew they were not welcome in other parts of the country and because those who had tried to resettle had frequently been the targets of violence, the majority remained where they were. On March 24 De Witt issued Military Order No. 3, which established a nighttime curfew and a five-mile travel restriction to be imposed only on persons of Japanese ancestry. On the same day, the first civilian exclusion order was issued on Bainbridge Island, in Washington, ordering the Japanese Americans there to leave the island within 24 hours. The Japanese began to sense that they would all soon be evicted from the entire West Coast, but because they were subject to the five-mile travel restriction, they were unable to leave the military zones and attempt to resettle elsewhere. By early April 1942, orders began to be posted in Japanese communities directing all persons of Japanese ancestry, both citizens and resident Aliens, to report to assembly points. With only a matter of days to prepare for removal, the Japanese were forced to sell their homes, cars, and other possessions, at tremendous losses, to neighbors and others who were eager to take advantage of the situation. By the beginning of June 1942, all Japanese Americans living in California, Oregon, and Washington had been evacuated and transported by train or bus to detention camps, which were officially labeled assembly centers. Over 112,000 Japanese Americans were evacuated and detained, approximately 70,000 of them U.S. citizens. Because the detention camps had been hastily arranged, they were largely made up of crude shacks and converted livestock stables located in hot and dry desert areas. Privacy was nonexistent; families were separated by only thin partitions, and toilets had no partitions at all. These bleak, crowded, and unsanitary conditions, combined with inadequate food, led to widespread sickness and a disintegration of family order and unity. Internees were forced to remain in the detention camps until December 1944, when the War Department finally announced the revocation of the exclusion policy and declared that the camps would be closed. This was two-and-a-half years after the June 2, 1942, Battle of Midway, which had left the Japanese naval fleet virtually destroyed, leading U.S. Naval Intelligence to send reports to Washington dismissing any further threat of a West Coast invasion. Though the majority of the Japanese Americans on the West Coast obeyed the harsh curfews, evacuations, and detentions imposed on them in a surprisingly quiet and orderly fashion, over one hundred individuals attempted to challenge the government's orders. Most of these people were convicted in court and lacked the financial resources to appeal. But a few cases reached the Supreme Court, including Yasui v. United States, 320 U.S. 115, 63 S. Ct. 1392, 87 L. Ed. 1793 (1943), Hirabayashi v. United States, 320 U.S. 81, 63 S. Ct. 1375, 87 L. Ed. 1774 (1943), and korematsu v. united states, 323 U.S. 214, 65 S. Ct. 193, 89 L. Ed. 194 (1944). Minoru Yasui, an attorney from Portland, Oregon, raised the first legal test of De Witt's curfew orders. A well-educated and very patriotic U.S. citizen of Japanese ancestry, Yasui did not object to the general principle of the curfew order or to a curfew applied only to aliens. His objection was that De Witt's orders applied to all persons of Japanese ancestry, both citizens and noncitizens alike. "That order," Yasui declared, "infringed on my rights as a citizen" (Irons 1983, 84). Determined to become a Test Case for the constitutionality of De Witt's curfews, Yasui walked into a Portland police station on the evening of March 28, 1942, hours after the curfew was first imposed and demanded to be arrested for curfew violation. Yasui was arrested. His case went to trial in June 1942, where he argued that Executive Order No. 9066 was unconstitutional. The judge in the case, James Alger Fee, did not return a verdict until November, when he found Yasui guilty. Fee asserted that Yasui's previous employment as a Japanese consular agent had constituted a Forfeiture of his U.S. citizenship, and thus he was subject to the curfew order as an enemy alien (Yasui, 48 F. Supp. 40 [D. Or. 1942]). Fee sentenced Yasui to the maximum penalty, one year in prison and a fine of $5,000. The Supreme Court unanimously upheld his conviction for curfew violation, though it found that Fee had been incorrect in holding that Yasui had forfeited his U.S. citizenship. The second test case involved Gordon Kiyoshi Hirabayashi, a 24-year-old student at the University of Washington. A committed Christian and a pacifist, Hirabayashi also decided to make himself a test case for the constitutionality of De Witt's orders, particularly the evacuation order scheduled to take effect on May 16, 1942. He therefore chose to break the curfew three times between May 4 and May 10, and recorded these instances in his diary. On May 16 Hirabayashi went to the Federal Bureau of Investigation office in Seattle, accompanied by his lawyer, and told a special agent there that he had no choice but to reject the evacuation order. Hirabayashi was convicted of intentionally violating De Witt's evacuation and curfew orders. The Supreme Court ruled on Hirabayashi's case on June 21, 1943, upholding his conviction for violating curfew. The Court avoided ruling on the issue of whether evacuation was constitutional by arguing that since Hirabayashi's sentences on the two counts were to run concurrently, his conviction on the curfew violation was sufficient to sustain the sentence. The Court did, however, rule on one important constitutional issue in Hirabayashi: the question of whether De Witt's curfew orders could be applied selectively on the basis of race. Writing for the majority, Chief Justice harlan f. stone emphasized that it was necessary for the Court to defer to the military in security matters, and thus the Court was bound to accept the assertion that "military necessity" required Japanese Americans to be selectively subject to the curfew order. Stone argued that the government needed only a minimum rational basis for applying laws on a racial basis, declaring that "the nature and extent of the racial attachments of our Japanese inhabitants to the Japanese enemy were … matters of grave concern." Citing undocumented allegations about the involvement of Japanese Americans in espionage activities, Stone concluded that the "facts and circumstances" showed "that one racial group more than another" constituted "a greater source of danger" to the army's wartime efforts and thus the military was justified in applying its orders solely on the basis of race. The third test case involved Fred Toyosaburo Korematsu, a 23-year-old welder living in San Leandro, California. Korematsu had no intention of becoming a test case for the constitutionality of De Witt's orders. He simply neglected to report for evacuation because he wanted to remain with his Caucasian fiancée and because he believed that he would not be recognized as a Japanese American. He was soon arrested by the local police and was convicted of remaining in a military area contrary to De Witt's exclusion orders. When Korematsu's case reached the Supreme Court in 1944, the Court upheld Korematsu's conviction, arguing that the "Hirabayashi conviction and this one thus rest on the … same basic executive and military orders, all of which orders were aimed at the twin dangers of espionage and sabotage." Noting that being excluded from one's home was a "far greater deprivation" than being subjected to a curfew, Justice hugo l. black wrote in the majority opinion that "we are unable to conclude that it was beyond the war power of Congress and the Executive to exclude those of Japanese ancestry from the West Coast area at the time they did." Black based his argument on the minimum rationality test established in Hirabayashi and on the military's assertion that Japanese Americans had to be evacuated en masse because it "was impossible to bring about an immediate Segregation of the disloyal from the loyal." But later in December 1944, the Supreme Court was faced with a more precise and pressing issue. Now came before it a matter wherein a United States loyal citizen of Japanese ancestry had been removed from employment and interned. The case of Ex Parte Endo, 323 U.S. 283 (1944), came before the Court as an appeal on a writ of Habeas Corpus. Mitsuye Endo was a female federal civil service employee at the California State Highway Commission. In 1942, she was dismissed from her stenography job and ordered by the military to a detention center. Endo was an U.S. citizen; her brother was serving in the U.S. Army. While at the relocation camp, her attorney filed a writ of habeas corpus in federal district court, asking for her discharge from camp and that her liberty be restored. The petition was denied and the Ninth Circuit Court of Appeals certified the matter to the U.S. Supreme Court. Again, the high court rendered its decision without coming to the underlying constitutional issue which was argued below. The Court, however, concluded that Endo was entitled to an unconditional release by the War Relocation Authority. It approached the construction of E.O. 9066 as it would judicially approach a piece of legislation. In so doing, it concluded that E.O. 9066, along with the underlying act of March 21, 1942, which ratified and confirmed it, was a war measure. Therefore, the Court reasoned, power to detain a concededly loyal citizen could not be implied from a power to protect the war effort from espionage and sabotage; it afforded no basis for keeping loyal U.S. citizens of Japanese ancestry in custody on grounds of community hostility. Interestingly, the U.S. government, apprehending an unfavorable decision in Endo, announced the end of the exclusion order just the day before the Supreme Court issued its opinion. The last of ten major detention camps, Tule Lake, closed in March 1946. Though the move to evacuate and detain Japanese Americans on the West Coast enjoyed substantial support from most U.S. citizens, it incited significant protests as well. Some critics, such as Eugene V. Rostow, professor and later dean of the Yale Law School, contended that the evacuation program was a drastic blow to civil liberties and that it was in direct contradiction to the constitutional principle that punishment should be inflicted only for individual behavior, not for membership in a particular demographic group. Others, such as Lieutenant Commander Kenneth D. Ringle, of the Office of Naval Intelligence, questioned the validity of De Witt's assertions concerning the disloyalty of Japanese Americans. In a memorandum written in February 1942 that became known as the Ringle Report, Ringle estimated that the highest number of Japanese Americans "who would act as saboteurs or agents" of Japan was less than 3 percent of the total, or about 3500 in the United States; the most dangerous of these, he said, were already in custodial detention or were well known to the Naval Intelligence service or the FBI. In his summary Ringle concluded that the "Japanese Problem" had been distorted largely because of the physical characteristics of the people and should be handled based on the individual, regardless of citizenship, and not on race. The Ringle Report was known to De Witt, who thus knew that Naval Intelligence estimated that at least 90 percent of the army's evacuation of Japanese Americans was unnecessary. In addition, the Department of Justice knew of the Ringle Report's conclusions when it filed its briefs in the Hirabayashi and Korematsu cases. A senior Justice Department official, Edward Ennis, had sent a memo to Solicitor General Charles Fahy warning, "I think we should consider very carefully whether we do not have a [legal] duty to advise the Court of the existence of the Ringle memorandum … It occurs to me that any other course of conduct might approximate the suppression of evidence." But Fahy chose not to mention the Ringle Report in the government's brief, instead asserting that Japanese Americans as an entire class had to be evacuated because "the identities of the potentially disloyal were not readily discoverable," and it would be "virtually impossible" to determine loyalty on the basis of individualized hearings (205). After the end of the war, some Japanese Americans began to seek financial redress for the losses they had suffered as a result of the government's evacuation program. In 1948 Congress passed the American Japanese Evacuation Claims Act (Pub. L. No. 80-886, ch. 814, 62 Stat. 1231 [codified as amended at 50 U.S.C.A. app. § 1981 (1982)]) to compensate evacuees for property damage. The Justice Department received more than 26,500 claims, and the federal government ultimately paid out approximately $37 million. Because the act required elaborate proof of property losses, the amount paid out was much less than full compensation for losses sustained. By the 1970s and 1980s, the movement to achieve redress had won additional victories. In 1976 President gerald r. ford formally revoked Executive Order No. 9066 and proclaimed, "We know now what we should have known then—not only was [the] evacuation wrong, but Japanese Americans were and are loyal Americans" (Proclamation No. 4417, 3 C.F.R. 8, 9 ). In 1980 Congress established the Commission on Wartime Relocation and Internment of Civilians, whose report, released in 1983, concluded that 9066 was not justified by military necessity and that the policies of detention and exclusion were the result of racial prejudice, war hysteria, and a failure of political leadership. The commission recommended several types of redress. In 1988 Congress passed the Civil Liberties Act of 1988 (50 U.S.C.A. app. § 1989 ), which provided for a national apology and $20,000 to each victim to compensate for losses suffered as a result of the evacuation program. A final major development in the redress movement has been the use of Coram Nobis, the common-law writ of error, to reopen the Korematsu, Yasui, and Hirabayashi convictions. A writ of coram nobis allows one who has served time for a criminal conviction to petition the court for a vacation of that conviction. Vacations are granted if there is evidence of prosecutorial impropriety or if there are special circumstances or errors that resulted in a miscarriage of justice. In 1983 U.S. district court judge Marilyn Hall Patel granted a vacation in the Korematsu case. Patel based her decision on the newly discovered evidence that "the Government knowingly withheld information from the Courts when they were considering the critical question of military necessity in this case" (Korematsu, 584 F. Supp. 1406 [N.D. Cal. 1984]). Yasui's and Hirabayashi's convictions were also vacated on this basis (Yasui, No. 83-151 [D. Or. Jan. 26, 1984]; Hirabayashi, 828 F.2d 591 [9th Cir. 1987]). Bettelheim, Adriel. 2002. "End of Exclusion: The Camps Experience." Excerpted from Exploring Japanese Internment. Available online at <www.jainternment.org/camps/end.html> (accessed August 3, 2003). Executive Order No. 9066. 1942. Federal Register (February 19). Irons, Peter. 1993. Justice at War. Berkeley: Univ. of California Press. Morris, Arval A. 1984. "Justice, War, and the Japanese American Evacuation and Internment." Washington Law Review 59 (September). Nash, Philip T. 1985. "Moving for Redress and Justice for All." Yale Law Journal 94 (January). Robinson, Greg. 2001. By Order of the President: FDR and the Internment of Japanese Americans. Cambridge, Mass. : Harvard Univ. Press. Tateishi, John. 1999. And Justice for All: An Oral History of the Japanese American Detention Camps. Seattle: Univ. of Washington Press. War Department. 1942. Final Report: Japanese Evacuation from the West Coast. Washington, D.C.: U.S. Government Printing Office. Weglyn, Michi. 1996. Years of Infamy: The Untold Story of America's Concentration Camps. Rev. ed. Seattle: Univ. of Washington Press. Coram Nobis; Discrimination; Prejudice; Vacate.